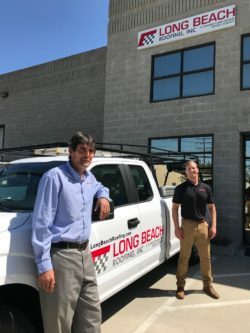 Long Beach Roofing has been in the business of keeping roofs over our heads for the past eight decades, and the company this year is celebrating its recent expansion and recognition as an industry leader. “We pride ourselves in our service and getting out to look at the needs of customers in a timely manner — especially for those emergency repairs when something is leaking really bad and it’s raining,” said Michael Walker, who leads the residential division of Long Beach Roofing. Walker, who isn’t afraid of heights, has been in the business for a quarter-century and has spent most of that time with Long Beach Roofing. He said the repair and replacement company started in 1937 and works with residential and mostly commercial clients. They’ve done work throughout Long Beach, including at the Long Beach Convention & Entertainment Center, at city libraries, and on various historic properties. to CEO Mark Carpenter of Columbia Roofing & Sheet Metal, which took ownership of Long Beach Roofing in 2014. Prior to Columbia’s ownership, Long Beach Roofing was an independent business started by the late Ray Haddock, then owned for about three decades by entrepreneur Conrad Banks. It’s now part of the 21-year-old Columbia family, headquartered in Oregon. 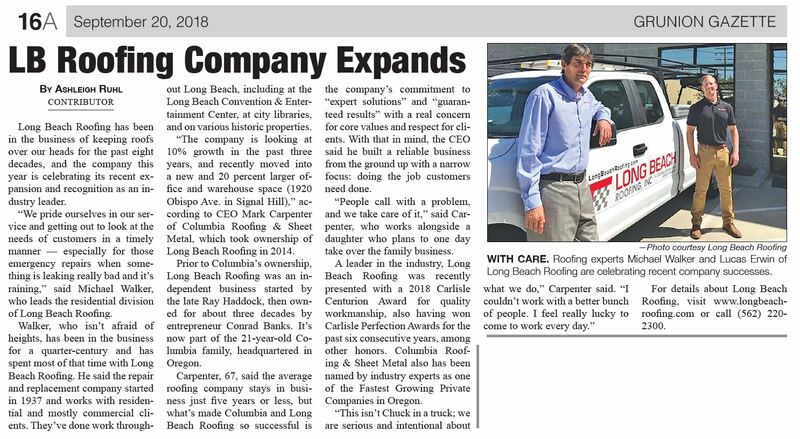 Carpenter, 67, said the average roofing company stays in business just five years or less, but what’s made Columbia and Long Beach Roofing so successful is the company’s commitment to “expert solutions” and “guaranteed results” with a real concern for core values and respect for clients. With that in mind, the CEO said he built a reliable business from the ground up with a narrow focus: doing the job customers need done. “People call with a problem, and we take care of it,” said Carpenter, who works alongside a daughter who plans to one day take over the family business. past six consecutive years, among other honors. Columbia Roofing & Sheet Metal also has been named by industry experts as one of the Fastest Growing Private Companies in Oregon.